Now here’s a find. You won’t fail to be entertained by the greatness of Evolver! Teen Kyle (Embry) likes to hang out at “TurboPlay Virtual Excitement”, a Virtual Reality (remember VR?) arcade of sorts. He’s so good at VR games, crowds come to watch him do his thing. So much so that his buddy Zach (Quinn) takes bets on this neo-Tommy and his neo-Pinball machine. It’s also there where he meets the cute Jamie (Rae) and they strike up a friendship/relationship. All seems to be going relatively well in Kyle’s world, and when robotics company Cyber Tronix eyes him as a popular video game fan, they announce him as the winner of the “Evolver” contest. What’s that you ask? Evolver is a robot that lives in your home and you play with him. He has built in “levels” that get progressively harder. It seems fun, but there’s one problem. Deep in Evolver’s (or “Evo” as the cool kids call him) is government-created warfare technology. Seeing everyone as an enemy, Evo goes off the rails and begins killing and maiming people. Can Kyle and Jamie put an end to the robotic chaos? Find out today! Evolver is a wildly entertaining movie that everyone should see. It has no fat or filler - and it doesn’t have much time to, as it can only be described as a Sci-Fi Horror Comedy Coming-Of-Age Tale. Amazingly, it all works and is a lot of fun. The movie takes cues from such movies as The Terminator (1984), Robocop (1987), The Last Starfighter (1984), Weird Science (1985), C.H.O.M.P.S. (1979) and most notably the two Short Circuit (1986) movies. But its heart is in lower-budget exploitation like Arcade (1993) or Chopping Mall (1986). The 90’s VR trend allows for some lovably dated graphics, and it all adds to the fun. 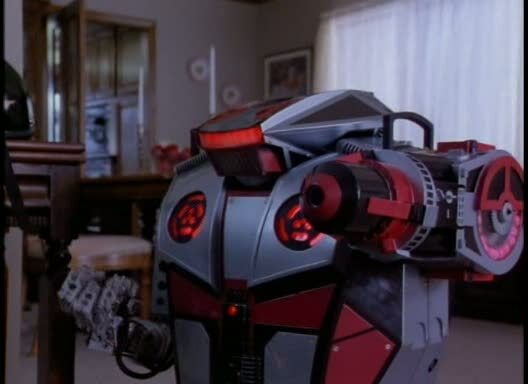 As far as the Evolver robot is concerned, this li’l homunculus is like some sort of bizarre melding of Nintendo’s Rob the Robot, a game of Laser Tag, a Tamagotchi, the “Happy Birthday Paulie” robot, a Roomba and Mr. Bucket. But instead of balls popping out of his mouth (remember the song?) - it’s metal ball bearings that shoot at you. Naturally the voice of Evo is none other than William H. Macy. It’s truly a career best performance. We’re not being sarcastic, he’s great as the tricky little bugger. Paul Dooley is on hand as the head of the robotics company, and Ethan Embry does a great job as Kyle. He’s a real teen and not a 37 year old in disguise. He really seems to care about the proceedings. What’s great about Evolver is that it’s just an insane idea that actually got made. It’s not really that predictable for most of its running time either. It should really be more well-known. 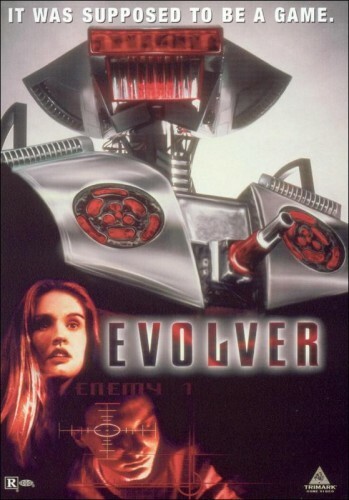 But maybe this movie was originally made as a tie-in or potential long-form commercial for a real Evolver you can buy in stores, but it never materialized. Either that, or there are hundreds of them buried in secret in the Nevada desert like the E.T. game for Atari. We just better hope they never wake up and go for revenge. Interestingly, in Kyle’s living room at home, not only does he have an NES, but a pretty decent VHS collection, and very briefly on screen you can see an assortment of Vidmark titles (Evolver is a Vidmark). One of which is one of the American Kickboxer (1990) movies! So clearly Kyle has good taste. Featuring the 90’s techno song “Beat the Machine”, Evolver will appeal to just about anybody. But fans of 90’s nostalgia especially will love the movie’s charms. We definitely recommend Evolver. Oh yeah I loved this movie, awesomely entertaining from start to finish! Arcade also holds a special place for me as it was the first Pyun film I ever saw. Major: Evolver is something that more people should know about and that anyone would love. Ingo: You definitely give this another chance. Venom: Totally agree, Evolver holds up very well today. Don't know how I've missed this. Sounds awesome. Love 90s virtual reality flicks, thanks for the heads up. No problem! This is a blast to watch. Looking forward to your opinion. I must see this. Immediately. Great find, too. I can't believe that William H. Macy is in this. As for your comment about a potential tie-in and toys being buried in the desert, that's how I feel seeing the GI Joe Retaliation toys @ Target. Awesome. Thanks! It was really odd\great to hear him as the voice of Evolver. It's his best role. Haha. That is hilarious about the GI Joe toys...Whoops....they never should have delayed the movie. I saw it on TV way back but don't remember much about it except John de Lancie. I'll have to see it again sometime. Cool. It is definitely worth a re-watch in the future! Hahahah! What he hell is this! Haha! You have to see it to believe it! Classic 90s. Haha, he didn't win the box office, but he won something more important....our hearts.